Caledonian Macbrayne's Loch Dunvegan on service 06 April 2012. Bulk carrier Frontier Bonanza inbound for Hunterston 02 April 2012. 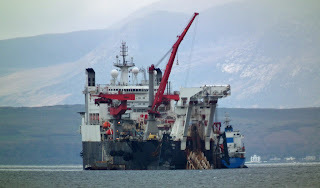 Pipelayer Solitaire undergoing repairs off Skelmorlie Bank en route to Shetland 01 April 2012. The business end of Solitaire, with Paxoi delivering much needed bunkers. Solitaire uses 1.7 tonnes of fuel per day in DPS mode!